Here is the latest news about Microsoft Excel, and updates on the Contextures website and blogs. Status Bar: Do you customize your Excel Status Bar, or keep the default settings? See all the options, and choose what you need. Pivot Tables: Macros quickly remove fields from Excel pivot tables - normal or OLAP (Data Model). Pivot Tables: Create a detailed list of all pivot tables in your workbook, to use with troubleshooting or workbook documentation. Error Values: Is it evil to show custom #Excel errors, instead of the built-in hash errors? Spreadsheet Roundup: Personal finances, spreadsheet tab patents, and more, in this month's roundup on the Spreadsheet Day blog. Pivot Tables: Show numbers as text in Excel pivot table values, with conditional formatting and a custom number format. Set this up manually or with a macro. Debra D Blog: Keeping track of your ideas, creating new ideas, and a fun little quiz. Pivot Tables: Instead of typing your pivot chart title, use a worksheet formula to create a dynamic title. Debra D Blog: Setting business goals for 2019 - what's your plan? Excel Roundup: Read the Excel Roundup for Fall 2018. 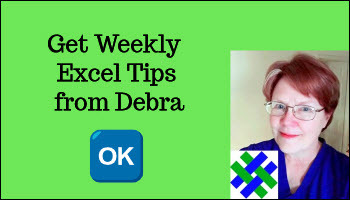 Excel tips, automation, data model info, Microsoft events, and more. Spreadsheet Day: Here are a few of the highlights from Spreadsheet Day 2018. Thanks for celebrating! Data Validation: What causes missing drop down arrows in Excel data validation? See how to fix or prevent the problem. Spreadsheet Day: Happy Spreadsheet Day, October 17, 2018! Are you planning any special functions? Spreadsheet Day: Get ready! Spreadsheet Day is October 17th -- how will you celebrate this year? Excel Ribbon: Put your own Excel macros on this custom Ribbon tab, by making simple changes on the worksheet. Video and written instructions. Excel Ribbon: Strange Excel command to cycle font color in the selected cell, and how to find button image names for a custom Ribbon tab. Conference: See new ways to automate Excel, at the Develop Excel conference in London, on Oct 18th. Register free, or with contribution. Pivot Tables: Macros name drilldown sheets when you double-click to create them, and delete some or all drilldown sheets when closing file. Comments: Excel threaded comments are coming! Be careful - legacy comment formatting is lost, if you switch while editing. ComboBoxes: Click a button on the worksheet, and a macro runs, to select the next item in the Combobox list. If the last item is currently selected, the next selection is the first item in the list. Comments: Use these Excel comment macros to resize, move, or format comments. Thanks to J. Woolley, who contributed the code and sample file. Pivot Table Macro: Use this macro to remove "Sum of" or "Count of" from pivot table headings. New macros work with data model pivot tables too. Secure Site: I've switched the Contextures site to HTTPS, so you should see the "Secure" symbol on every page. If you spot any problems, or pages without that symbol, please let me know! Big thanks to Steve Friedl, a former Enterprise Security MVP, and Linux expert with 30+ years experience. Lookup Table: Use Excel INDEX with 2 MATCH functions for mileage lookup between cities. Hyperlinks: Use enhanced hyperlinks in Excel, to link to chart sheets, or activate a sheet without selecting a cell. Technique by J. Woolley. Exipry Dates: Keep track of expiry dates in Excel - highlight items that will expire soon, so you won't miss them. Hyperlinks: Use Excel hyperlinks to run command or script files with a single click. Also, SuperLink UDF improves on Excel's HYPERLINK function. Task List: Use this quick trick to automatically cross off tasks in an Excel To-To list. No macros - just easy formatting. Data Model - Are you confused by Excel's data model? Sign up for a free live webinar, Build an Awesome Data Model in 7 Easy Steps, from Excel TV. Pick a time on March 29 or 30. Macros: Learn how to automate Excel, and save time! Sign up for the new one-hour free Macros & VBA Webinar from John Michaloudis. See how to record a macro, and set up a button to run it. Learn how to save and share your macros. Pivot Tables: Fun with Excel pivot tables & Olympic hockey player data. Did younger/taller/heavier team win? Pivot Tables: How to fix problems when grouping pivot table items, if you get an error message, "Cannot group that selection." Functions: Count items in a cell with Excel's SUBSTITUTE, LEN and TRIM functions. Check for minimum count, like 3 items in valid address, "123 Main St"
Table Filter: Quickly filter an Excel table with a spin button - click up and down buttons to filter by next or previous item in the list. Excel Roundup: Read the Excel Roundup for Dec. 14, 2017. Free Power BI book, dashboard tips, Excel complaints, Christmas tree, and more. Planning: Get ready for the holidays with this Excel Holiday Planner Workbook. Budget, event calendar, task list, dinner planner and more. Subtotals: Do you still need Excel subtotals? Should you use AGGREGATE or SUBTOTAL? Pivot tables or the Subtotal feature? Troubleshooting: Data validation troubleshooting macros and tips -- find all the data validation cells in a workbook, and list all the rules. Power Query: Become a Data Wizard and master your data in Excel and PowerBI. Ken Puls and Miguel Escobar are offering their next online workshop November 15-16, 2017, with follow-up Q&A on November 29th. Click to get the full course details and registration information. Space for this session is limited, so don’t miss out! Excel Macros: Simple steps to create a tartan pattern in Excel -- base your tartan on a traditional pattern or make your own! Free workbook with Ribbon commands to make it easy. Lookup Formula: Can you solve this Excel lookup formula challenge? Write a formula to find the customer code for each row in the imported data. Excel Macros: Excel formulas are awesome, but you can add more power to Excel with macros. To help you get started, Jon Acampora is hosting free webinars that show you 7 of the basic steps. The webinars available this week only -- October 23rd to 27th. This webinar is for beginners, so don't worry that it will be over your head -- Jon will explain things clearly and simply. Sign up now -- click here to pick a day and time to attend. (You can watch the replay later, if you miss your session). Pivot Trick: Use this quick trick to add or move pivot table fields. Did you know that you could do this? Most people don't! Data Bars: Show Excel Data Bars, then use MIN and MAX formulas to adjust the bars. Spreadsheet Day: Happy Spreadsheet Day 2017! (Tuesday, October 17th) How are you celebrating? Spreadsheet Day: Are you ready to celebrate Spreadsheet Day 2017? It's next Tuesday, October 17th. Dashboards: Learn how to build interactive dashboards with Power BI and Excel, in a free one-hour webinar by Mynda Treacy. Go from raw data in Excel, to sophisticated dashboards, in a few simple steps, using free tools. Register today -- the webinars are available for a limited time. Pivot Tables: See how to make quick copies of a pivot table - one copy for each item in a Report Filter. Or use a macro to make copies of the entire sheet. Pivot Table Percentages: Show pivot table values as percentages, to make it easy to compare totals. See % of Column, % of Parent Row and % of Parent Total. Pivot Tables & BI: Ken Puls (ExcelGuru.com) sits down with the team from Excel TV to show how you can use pivot tables to build Business Intelligence (BI) solutions in Excel. There are 3 free videos in the series, so click here to get started. Pivot Table Totals: Use the Show Values As feature to show pivot table totals as a percentage of a parent field amount. For example, % of Region sales for blue binders. Hyperlinks: Use Excel hyperlinks to run command or script files with a single click. Excel History: Do you remember the early days of Excel? Old Excel tips (still useful) and version 2.2 review highlights. Functions: Convert measurements in Excel with drop down lists of units. Kg→Lb, Ft→Km and many more measurement types. Debra D Blog: Should you use SamCart or E-junkie for digital product sales? Debra D Blog: Missing month headings in Access report- easy fix but hard to find! Excel Slicers: Pivot table trick saves space - click filter cells to show on demand Slicers. Perfect for sheets with multiple Slicers. Error Checking: In his new course, Ken Puls shows how to build an error checking system in your workbooks. Be confident that everything is calculating correctly, even if you haven't looked at the workbook in months! See how to create an error checking section on each worksheet, and a global check point for the entire workbook. The system even checks the pivot tables, to see if they've been updated -- that can prevent serious problems! Follow the course online, or download to watch offline too. Pivot Power Premium: There was a major update to my Pivot Power Premium (PPP) add-in. New features - click a button to quickly get the settings from any pivot table, then 1 click to apply those settings to any other pivot table, or all pivot tables. To get the update, use your latest download link. Excel Training: Mynda Treacy has just opened registration for her highly-rated Excel Dashboard Course and Power BI Course. I highly recommend these courses, so don't miss this chance, if you're interested. Free Webinars: If you're not ready for the full courses, attend one of Mynda's free one-hour webinars on Power BI or Excel Dashboards. They're only available for a limited time -- June 27th to July 13th. Excel Skills: What are the key Excel skills for specialists in your profession? Which functions or features do you use most often? Training - Learn more about Pivot Tables or Power Query, in the free 1-hour webinars that John Michaloudis is hosting. Pick a date and time that fit your schedule. Hide Used Items: To prevent people from selecting the same item twice, hide used items in a drop down list. Filter a List: Two ways to filter Excel data for items in a list: 1) exact matches only, 2) partial match in cell contents. Fiscal Year Summary: Line up weekdays in a pivot table, to compare sales data for two fiscal years. Formulas in source data calculate fiscal week and weekday. Excel Macros for Beginners: Allen Wyatt, from the Excel Tips website, has 4 free videos that give you a basic introduction to macros, and show how they can help you work more efficiently. Excel VBA: Join Jon Acampora for a free online webinar -- The 7 Steps to Getting Started with Macros & VBA. Sessions are available from May 8-12, 2017, so pick the date and time that works best for you. Price Lookup: How to do a price lookup based on an invoice date and product name. Rounding: See 7 ways to round numbers in Excel. RANK IF: Use an Excel Rank IF formula to rank a number within a specific set of numbers. Excel Sheets: Keep a list of sheets open, so it's easy to navigate in a large Excel workbook. Subtotals Problem: Pivot table subtotals have changed, for grouped items, in the latest version of Excel 2016 (subscription). Learn about the change, and how to avoid problems. Dashboards: Ben Collins shows how to build interactive dashboards with free Google Sheets tools, in his new course. Worksheet Buttons: How to change Form Control button names or create a list of worksheet button names and cell location. Problems and quirks with button names. Excel Dashboards: Registration is now open for Excel TV's online course, Excel Dashboard Pro. Use coupon code contextures20 to get a 20% discount. Read my review of the course. Closes Feb. 7, 2017. Learn Macros and VBA: Attend a free webinar by Jon Acampora, to learn the basics of Excel macros and VBA. Excel Dashboards: What hashtag would you use to get help with an Excel Dashboard? Go to the blog post, and add your comment to enter the giveaway for Excel TV's new Excel Dashboard Pro course. VisiCalc History: See Dan Bricklin's and Mitch Kapor's tweets about the Software Arts (VisiCalc) anniversary. Pivot Table Macro: Instead of manually removing pivot fields from a pivot table layout, use a macro to quickly remove them. Dashboard Webinar: Attend one of Mynda Treacy's free Excel Dashboard webinars this week. Lots of great tips packed into a 1 hour presentation. Get Organized: How to organize your Excel files, so you can find workbooks when you need them. Power Query and Data Cleansing: Free Power Query and Data Cleansing webinar presented by John and Oz at MyExcelOnline. Learn how to transform messy data and automate reports. COUNTIF: Take the Excel COUNTIF challenge -- can you find the problem with this formula, and fix it? Drop Down Lists: To prevent duplicates, hide used items in a data validation drop down list. The list only shows the remaining items, not the full list, to make data entry easier. Pivot Table List: Use this macro to list all pivot tables in Excel file -- helps with troubleshooting in a complex workbook. 2016/10/27: Create an interactive Excel chart - select date range, choose criteria, pick value series. 2016/10/20: Show data validation error messages to help people enter data correctly. Or, turn error warnings off, to allow other entries in a cell. 2016/10/17: Happy Spreadsheet Day 2016! What are you doing to celebrate? 2016/10/04: Show a distinct count (unique count) in a pivot table (Excel 2013 or later). 2016/09/29: Take a short break from spreadsheets, and join the Excel sing-along! 2016/09/20: How pivot table grand totals are created, and which grand total headings you can change. 2016/09/22: Instead of an in-cell drop down list, show a combo box with bigger font and autocomplete. Now works with simple dependent data validation too. 2016/09/06: Create a pivot table instantly, then make simple changes to get a different view of the data. 2016/08/04: After a recent Microsoft update, some Excel add-ins are not loading correctly. To fix that problem, you can, follow the instructions here, to unblock the files. Read the background story on the blog. 2016/07/20: Use this macro to quickly get rid of "sum of" in Excel pivot table headings. For selected pivot table only, or all pivot tables. 2016/07/07: Use a drop down list to show sheets based on their tab colour in Excel. Other sheets are hidden -- choose "(All)" to see all sheets again. 2016/06/16: Use a drop down list to show specific sheets in Excel. Other sheets are hidden -- choose "ALL" to see all sheets again. 2016/05/10: Use a macro to remove calculated fields from an Excel pivot table, without seeing an error message. 2016/04/21: Choose an option from an Excel drop down list, to control what data shows in the worksheet. For example, pick a language, to change date formatting codes. 2016/04/17: How to fix an Excel pivot table that is showing rounded times. Zeros appear, instead of tenths of a second or hundredths of a second. 2016/04/14: Create an Excel hyperlink with drag and drop. Drag to different sheet, or to nearby cell, then copy and paste to Table of Contents. 2016/04/07: How to fix Excel pivot table time problems - zero rounding and incorrect totals. 2016/03/31: Use Slicers to select criteria for an Excel filter. Send the data to a different sheet, and use drop down lists to select fields for the output. 2016/03/24: Highlight latest numbers in long Excel list. Conditional formatting colors all matching cells, different color of last occurrence. 2016/03/17: Go to a specific sheet in an Excel workbook -- drop down list of sheet names, no macros. 2016/03/10: List all Excel sheets with their used range address and size - helps with troubleshooting large workbooks. 2016/03/03: Is your VLOOKUP formula returning the wrong results? This simple thing can cause errors that you might not notice. 2016/02/25: Use a pivot table to count unique items, e.g. in 100 orders how many different customers? 2016/02/04: In the Data Validation Multi-Select Kit, or other Excel code, make a small change to run faster in large workbooks. 2016/01/28: How to fix Excel numbers that don't add up, with Paste Special - Add. 2016/01/21: Show macro progress update messages in #Excel Status Bar. 2016/01/14: Show Excel macro buttons on floating form -- move to any area of the worksheet. 2015/12/17: Interactive Excel Christmas tree - no macros - formulas and conditional formatting. 2015/12/10: Calculate project end date with WORKDAY.INTL function, and set your own non-work days and holidays. 2015/12/03: If you merge cells, Excel won't adjust the row height like it does for other cells. You can use a macro to fix the row height before you print, so all the text is visible. 2015/11/19: It's the Contextures website's 15th anniversary. How old are your files? Get a list of Excel files with date the content was created. 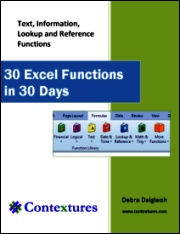 2015/09/30: Happy 30th Anniversary Excel! Do these stories remind you of your earliest Excel memories? 2015/09/30: Jon Peltier has released Version 3.0 of his Excel Charting Utility. Works on both Windows and Mac. 2015/08/13: Prevent invalid time entries with drop down lists of hours and minutes. 2015/07/30: Show a chart or its data on a dashboard, by choosing from a drop down list. 2015/07/20: Excel Roundup: Excel Dashboard webinar, pivot table trick, survey-love or hate Excel? 2015/07/16: Copy the numbers only, in a column with numbers, blank cells, and text. 2015/07/02: Use the Rank calculation in an Excel pivot table, to make it easier to compare data. 2015/06/18: Download the free Excel weekly meal planner - select meal items and print a shopping list. Functions calculate costs, with a pivot table and macro for the shopping list. 2015/05/13: Great Excel pivot tables need well-designed source data. These tips & macros will help. 2015/04/23: Upcoming free online events for Excel fans -- catch these before their deadlines! 2014/12/18: Count hotel guests in a date range, based on arrival and departure dates. 2014/12/11: Select multiple items from a long drop down list, using a popup form with combo box and list box. 2014/12/05: This week's collection of Excel tweets, for your Friday entertainment. 2014/09/18: Problem with Excel 2013 worksheet combo box; won't use list directly based on table. 2014/09/11: Select from 1st drop down, macro clears dependent drop down cell, to prevent mismatches. 2014/09/04:When testing VBA code, the F8 key didn't always stop at the next line; registry change seems to have fixed the problem. 2014/08/21: Create random text for sample data, with Excel functions RANDBETWEEN and CHOOSE. 2014/08/20: Remove "Sum of" from pivot table value field headings - video shows the steps. 2014/08/07: Use an Advanced Filter to find the top 5 orders, for products sold after a specific date. Show the results in place, or send the list to a different worksheet. 2014/07/24: Use the REPT function to set a minimum row height. Makes it easier to read a list, or maintain row height for pictures. 2014/07/23: There is a new Pivot Table Tutorials index page to help you find articles, and I'm updating the Pivot Table FAQ list. 2014/06/19: For large, complex Excel files, there are helpful add-ins to make the job easier. Some are free, and others are paid. 2014/06/18: Show the fiscal year and month to date totals in a pivot table, when you add calculations in the source data. 2014/06/17: With a simple macro, you can automatically show or hide a worksheet, if a specific cell changes. 2014/06/17: Book release -- PowerPivot Alchemy: Patterns and Techniques for Excel, by Bill Jelen and Rob Collie. 2014/06/12: Create a family tree in Excel, using Smart Art's organization chart, and VBA, with a sample file from Prof. Lee Townsend. 2014/06/11: Show fiscal year and fiscal month totals in a pivot table, by adding calculations in the source data. 2014/06/04: Learn how to turn off the GetPivotData formulas that create an absolute reference when you link to a pivot table. 2014/06/05: You can use shortcuts to quickly create a chart on a new sheet, or embedded on the active sheet. 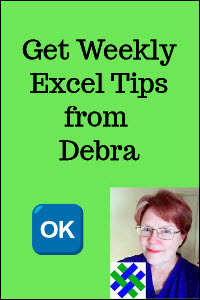 2014/06/05: See quick tips for auditing Excel formulas, and doing some troubleshooting on a worksheet. 2014/05/28: Steps for copying and using sample pivot table code in your own workbooks. 2014/05/28: Create IFRAME code with formulas, and copy it to your web page or blog article, to embed a YouTube video, or other content. 2014/05/20: Roger Govier shared two ways to get a unique count in a regular pivot table. 2014/05/21: Do some troubleshooting with the new SHEET and SHEETS functions in Excel 2013. 2014/05/08: Book Release -- Quantitative Finance: A Simulation-Based Introduction Using Excel, by Matt Davison.